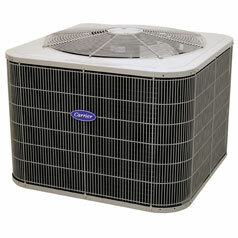 Treat’s Heating and Cooling give our customers an extensive selection of air conditioning services in Washington. Our goal is to meet the needs of our customers by providing on-going system maintenance, system repairs, or a brand new air conditioning system installation. We have been serving Washington for 40 years, and you can be confident by choosing Treat’s Heating and Cooling, you are choosing a company you can depend on to get the job done right the first time. It’s important to be confident that the money you are investing toward an air conditioning system is invested in a company you can rely on. Our highly skilled technicians will meet with you and discuss your needs and then offer a range of recommendations that will best suit your needs and family budget. Not only can we recommend a new system to homeowners looking to invest in air conditioning for the first time, but we can also offer homeowners with existing systems options for less costly, more efficient systems. Living in the Northwest where are temperatures are fairly mild the majority of the year, it can be easy to underestimate the importance of air conditioning maintenance. We have learned that customers who regularly maintain their air conditioning systems are more likely to spend less money over the life of their system than those customers who ignore the maintenance and are left facing urgent, costly breakdowns. The benefits of regular maintenance far outweigh the inconvenience. First, a system that runs at peak efficiency will save the homeowner a considerable amount of money over the life of their system since it will require less energy to cool your space. Second, maintenance repairs are far less costly than emergency repairs that often occur during the season of greatest demand for air cooling. Third, inviting a technician to inspect your system on a regular basis provides them the opportunity to spot potential signs of future mechanical breakdown of your system, which saves you money and unnecessarily bearing the uncomfortable heat of summer. Regardless of which company installed your system, Treat’s Heating and Cooling can service and repair any type or model of air conditioning system and keep it operating at its most efficient level possible. Unfortunately, systems that have not undergone routine maintenance often experience system failure at the most inconveniently hot season of summer. 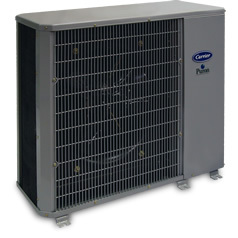 Typically we kick out cooling systems into high gear and run them non-stop after a long season of non-use. When a system is not used, there is no way to know it is not functioning properly. When a need for repair presents itself, you can rely on the expert team at Treat’s Heating and Cooling to quickly diagnose the repair and get your system functioning again at its highest efficiency. In the process of diagnosing the problem and cost of your AC repair, our technicians will also comparing the cost effectiveness of installing a new system altogether rather than allowing your old system to continuously drain your bank account. It is our desire that our customers are aware of all of their options and feel confident in making the best decision for their family and budget. Carrier knows air conditioning. After all, they invented it—and they have been perfecting central air conditioners for over a hundred years. Their advanced Infinity® Series offers the highest efficiency in central air conditioning, while the Performance™ Series and Comfort™ Series products provide economical efficiency and complete comfort. 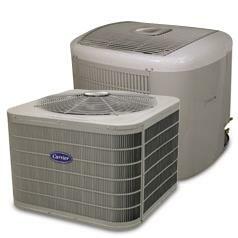 Even though Carrier is our preferred Brand of choice, we service & maintain all major brands of Air Conditioners. Please call for any questions regarding any air conditioner of your choice. We would be happy to serve you!